Home » Posts tagged "Lauren Alaina"
Unfortunately, it doesn’t really feel wrong to me. Women get the short stick when it comes to the Top 9, even in rounds where there are only 3 of them left. Haley’s performance was good, but not quite good enough according to the model, especially considering the order that she went. Now there is no clear favorite to go. 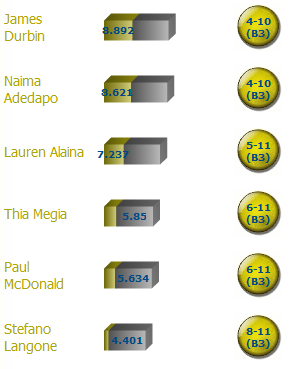 Haley, Lauren, Stefano, and Jacob are the likely bottom vote getters. Everyone else has a much smaller probability. But it would not be shocking if Stefano (P = 18%) were to go instead of Haley (P = 29%). But, the smart money is on Haley. Now that we’re in the Top 9, the odds of being eliminated as a man get marginally bigger. The problem here is that the data from previous seasons is lopsided towards women; therefore, I’ve based current projections only on seasons with 3 or 4 women only left in the Top 9. This week now incorporates average prior approval ratings into the mix, taking the average of the last three weeks. Conventional wisdom is that Pia Toscano needs to step up her game, and I don’t see any reason why this is wrong. Despite having only 3 women, they are still at a huge disadvantage here, and her performances lately have been perceived as boring. Her song choice this week, River Deep – Mountain High, is in my opinion a terrible choice. It is a marginally well-known song, and has a limited but disastrous track record on the show. She runs the risk of being forgettable very easily; if you’re rooting for her, it could come down to performance order, so hope for the pimp spot. Last week notwithstanding, Haley Reinhart is still in big trouble. She has to beat Paul and Stefano by about 10 points to not be considered likely to be in the bottom 3. Lauren, Pia, and Paul are all about equally likely to go, and so their performances will sort them out. The only people I consider bulletproof are Jacob Lusk and James Durbin, though Jacob is certainly singing against type this week, as it’s Rock and Roll and he is more of a soul/R&B guy. On the one hand, Dialidol got 2/3 of the bottom 3. However, it significantly overestimated Naima, which my model had by a factor of 4 the most likely to be eliminated. I also get no sense that Lauren was possibly at risk, but Dialidol ranked her as fourth worst. Does anybody really believe that? The people I would worry about Thia, Lauren, and Haley. All women, all 20 or younger, and two of which were in the bottom 3 already.